US/Silver Spring: Torrent Pharmaceuticals Limited, an Ahmedabad, Gujarat establishment, expands its existing recalls from two (2) lots of Losartan Potassium Tablets USP to a total of ten (10) lots all unexpired batch/lots of due to suspected N-Nitrosodimethylamine (“NDMA”) contamination and consequential risks of Carcinogen damage and Cancer, all serious health hazards. 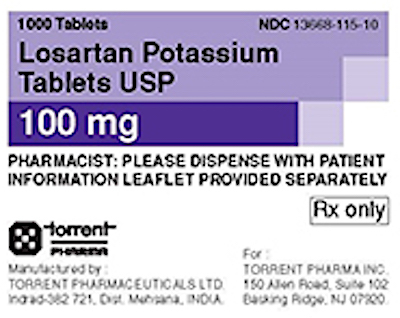 US/Silver Spring: Torrent Pharmaceuticals Limited, an Ahmedabad, Gujarat establishment, recalls all unexpired batch/lots of Valsartan/Amlodipine/HCTZ, Valsartan/Amlodipine and Valsartan Tablets due to suspected N-Nitrosodimethylamine (“NDMA”) contamination and consequential risks of Carcinogen damage and Cancer, all serious health hazards. US/Silver Spring: Camber Pharmaceuticals, Inc., a Piscataway, New Jersey, establishment, recalls all all unexpired batch/lots of Valsartan Tablets due to suspected N-Nitrosodimethylamine (“NDMA”) contamination and consequential risks of Carcinogen damage and Cancer, all serious health hazards. 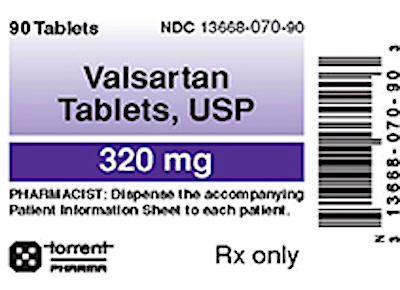 Valsartan Tablets, USP, is a prescription medication used to treat high blood pressure and congestive heart failure and is packaged in 30-count bottles & 90-count bottles, all associated codes are provided in the table below with batch/lot designations and expiration dates.